Senate Bill 9 designates the Eastern hellbender as the official amphibian of the Commonwealth. The House State Government Committee voted to move Sen. Gene Yaw’s bill out of committee for a floor vote. House Bill 284 updates and modernizes the History Code regarding records, archives and properties. House Bill 60 removes all “FUTURE” employees of the Susquehanna River Basin Commission from the State Employees Retirement System as they are NOT state employees. This move will help lower costs of the commission which is largely funded by PA municipalities. 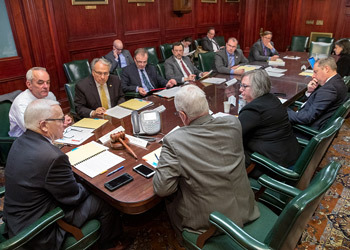 On Monday, Feb. 4th, I was re-elected Vice-Chairman of the Center for Rural Pennsylvania’s Board of Directors during its reorganization meeting at the State Capitol for the 2019-20 Legislative Session. I will join fellow officers Sen. Gene Yaw, Chairman; Dr. Nancy Falvo, Secretary and Stephen Brame, Treasurer. The Center is a bipartisan, bicameral legislative agency that serves as a resource for rural policy within the Pennsylvania General Assembly. A number of Targeted Research Topics for the 2020 Grant Program were approved by the Board during the meeting. A few noteworthy projects approved include an Examination of the Substance Abuse Treatment Workforce in Rural Pennsylvania; Survey of Small Town Police Chiefs to better understand the issues facing “small-town” police departments; Analysis of Municipal Land Use Planning Tools in Rural and Urban Pennsylvania, as well as an Examination of the Mental Health Workforce in Rural Pennsylvania. A number of mini-grants were also awarded. To learn more about the Center’s work, visit here. The Senate Game & Fisheries Committee on Tuesday approved Senate Bill 147, which would empower the Pennsylvania Game Commission to allow Sunday hunting. The Senate will likely pass the legislation and from there it would be considered by House. Please contact me with your thoughts on Sunday hunting in Pennsylvania. I know this is a hot topic of debate in the outdoorsman community and, as a member of the House Game and Fisheries Committee, I want to make sure every voice is heard. While freezing temperatures over the past several weeks have allowed ice to form on countless bodies of water across the Commonwealth, the rapid onset of spring-like warmth, even for just a few days, should be considered when venturing out onto the ice. Read the PFBC warning with more safety steps for venturing onto the ice here.